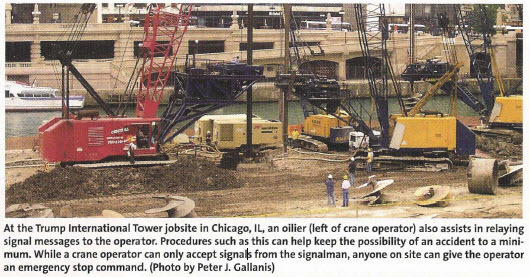 As originally published by Craneworks, September 2005. Each company from management down should seek to contribute to a sustainable developed safety program. This should not just be a program that barely meets the guidelines of the OSHA program. Rather, it should be a rigorously analyzed program with sound strategies to avoid any adverse effects. Quarterly and ongoing training is an approach that underpins your success. Respecting laws and customs is not enough. We need to minimize adverse effects and strive to improve every aspect of our performance of safety in the workplace. Policies for each construction company should start from the top management, widely examining the project design from onset to finish with a safety committee that has authority. Many companies appoint a safety committee as a facade. When the safety leader tries to enforce proper safety rules, he is strongarmed by many supervisors to lay back, with money and time being the underlying reason. Safety should be as important as a child's life. After all, most fatal accidents leave a child fatherless, or motherless. Your company should expect any joint partner or subcontractor to follow your practice in safety, maintaining high standards themselves. Commitment, both in principle and practice, is to maximum transparency consistent with good safety and health governance, as well as confidence, built with relevant local laws, regulations, and standards. Good safety leadership requires all of us to accept responsibility. Your safety plan should be set within the context of the worksite intended, which can differ with each project you undertake. How do we achieve these high standards? With training, hazard examination, proper operating procedures requirements for safety, and plans for emergency procedures. Mandatory classes for the training of all personnel, not just that 20-minute Tuesday morning before work with a generic hand-out training session, coffee in hand, and a signature required before your eyes are open kind of meeting. Hiring an outside service provider is usually your best bet. They are professionals in their service and can accommodate the different preferences of the job at hand. A healthy workforce contributes to business success, when commitment to preventing occupation injury and disease comes first. I strongly recommend a general safety advisor, and a service provider educated in the crane and equipment industry. This will give you safe and effective working conditions at all levels, and the elimination of workplace injuries. Safety is a core value and a priority goal. Everyone's behavior contributes to an injury-free workplace; full and consistent implementation of and accountability for comprehensive standards, guidelines, systems, and procedures are required. Alongside this, you are building a supportive safety culture that requires visible leadership, ongoing education, training, and a high level of participation by everyone in the workplace, placing an uncompromising emphasis on hazard identification, risk assessment, and management.